This delicious smooth mustard is made from organically grown mustard seeds, organic vinegar and sea salt. 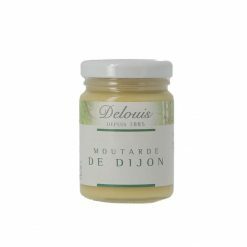 Delouis’ vinegars and mustards are all authentic, natural and organic. Its mustards have won prizes at the Napa Valley World-Wide Mustard Competition for six consecutive years (1995-2000) and are used by leading chefs. Its vinegars, too, long ago won awards, in 1885, 1922 and 1924. Today, with Gael Brabant as company president, Delouis is led by two fundamental principles: innovation and respect of French gastronomic traditions. The company complies with the strictest quality and environmental requirements, and its organic products are certified. In terms of food safety certification, it is accredited as Grade A by the British Retail Consortium Global Standards and as Higher Level by IFS, a certification issued by a union of German supermarket chains. Its organic products are certified by Ecocert, one of the largest organic certification organisations in the world. Delouis uses only the finest, organic ingredients in its products, which contain no artificial additives. Ingredients: organic mustard seeds, organic alcohol vinegar, sea salt.